Whether it’s a pet stain or the stain from a spilled drink, a blemish on your mattress can make getting a good night’s sleep difficult. Fortunately, there are many techniques for removing mattress stains that can be completed within the home. 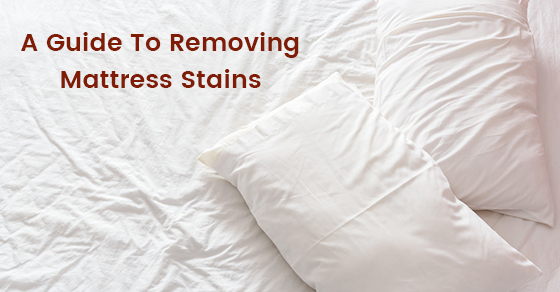 In this latest post, our furniture waste removal team explains how to remove mattress stains. The first method is to try to remove the mattress stain before the stain dries onto the material. The moment it dries and soaks in, it becomes more difficult to remove, as it has impacted deeper into the material. When approaching a wet stain, be careful not to add too much liquid to the area, as this can spread the stain over a wider part of the material. You should also try to test any cleaning products on a hidden part of the mattress to ensure it doesn’t damage the area. When removing stains from your mattress, it’s important to know which chemicals react with which types of staining liquids. For example, you can remove blood from a mattress with a combination of salt and water. You can remove pet stains with white vinegar. And you can clean a coffee stain from a mattress with equal parts white vinegar and alcohol. Remember to rinse gently, and then let it dry. When a stain is embedded deeply into the mattress and the material has an odour, you might consider choosing an enzyme cleaner to resolve the issue. The enzyme cleaner can help remove the bacteria causing the odour, while keeping your mattress in peak clean condition ready for long-term use. Simply using more of the stain removing product is unlikely to have an effect on the stain if the original liquid didn’t work. The difficulty is that the excess liquid can then seep into the mattress and cause mold and mildew over time. Try to use only a small amount of the cleaning product to mitigate the chances of lasting damage. Our trusted team is here to guide you in keeping your home in peak clean condition. To discover more about the process of cleaning mattresses, speak with our furniture waste removal team today! This entry was posted in Stain Removal on July 21, 2017 by Junk King. Last updated July 11, 2017 .